“The train… will have wheels that can be adjusted to fit various gauges on other countries’ tracks, compared with trains now that need to have their wheels changed before entering foreign systems,” Jia Limin, the head of China’s high-speed rail innovation program told the media. Trains in Russia run on a 1520mm track, compared to the narrower 1435mm track used in Europe and China. “Once the new bullet train is put into service, it will operate on China’s rail network as well as on the Moscow-Kazan high-speed line in Russia, which is designed for 400 km/h trains,” he added. 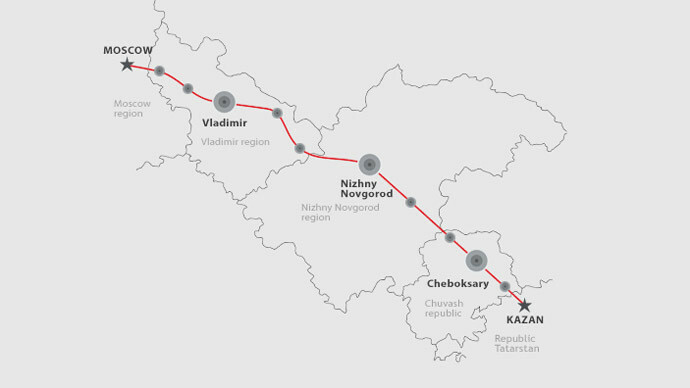 The new 770 kilometers of track between Moscow and Russia’s Tatarstan capital Kazan will stretch through seven regions of Russia. The track is a joint project of Moscow and Beijing.